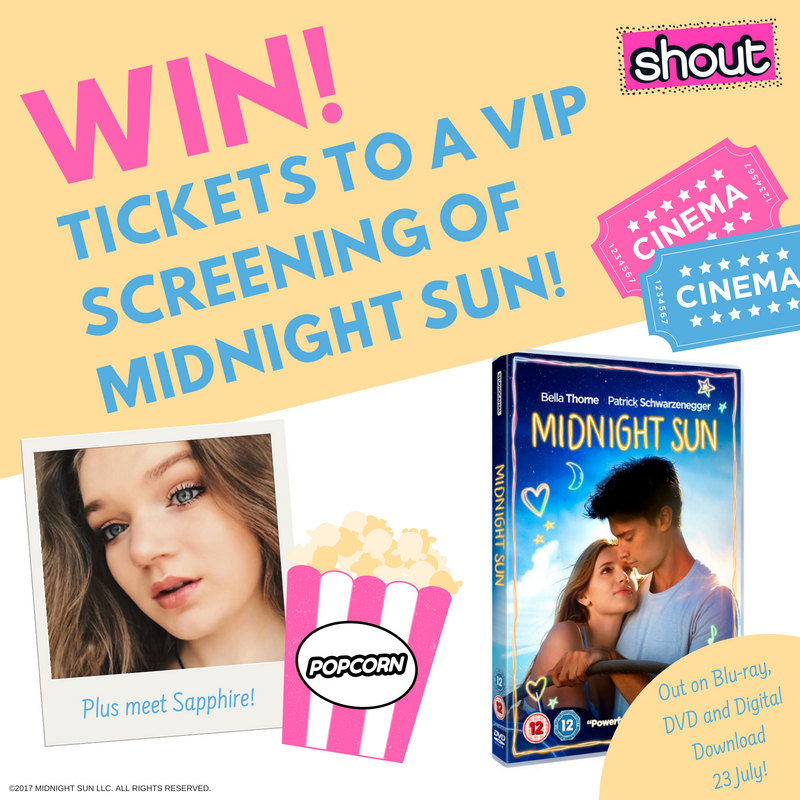 To celebrate the DVD release of Midnight Sun (out on 23rd July), we’ve teamed up with YouTube star Sapphire to put on an exclusive preview screening for you guys, followed by a performance of the soundtrack by Sapphire and a meet & greet! There are 25 pairs of tickets up for grabs – what are you waiting for?! MIDNIGHT SUN tells the life-affirming story of 17-year-old Katie Price (Bella Thorne, The DUFF, Famous in Love series), sheltered since childhood with a rare disease that makes even the smallest amount of sunlight deadly. During the day she is housebound but it is after nightfall that Katie’s world opens up when she ventures out to the local train station to play her guitar for travelers. One night, fate intervenes when she meets Charlie (Patrick Schwarzenegger), an ex-high school all-star athlete, whom she has secretly admired for years. She hides her condition from him as the two embark on a uniquely powerful romance over one nearly perfect summer. What is Bella Thorne’s star sign? Send your answer, along with your name, age, address, and email address of your parent/guardian to competitions@shoutmag.co.uk. Please put MIDNIGHT SUN in the subject line. The competition closes on Sunday, July 22. Winners will be contacted via email. If winners cannot be contacted within 24 hours, they forfeit their prize and another winner will be picked. Please note this prize does not include travel or accommodation.